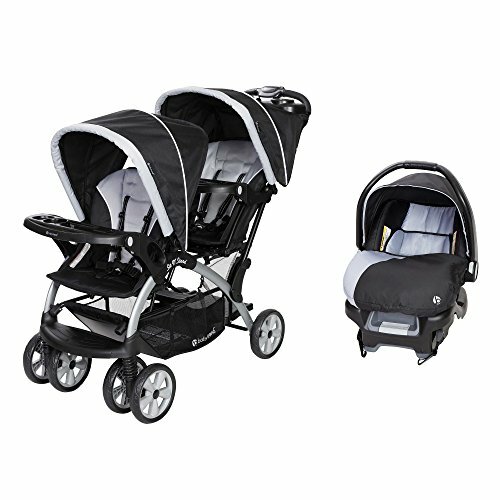 Double the safety, double the style, and double the babies - that's what you can do with the Baby Trend Sit N' Stand Double Infant Stroller. This convertible double stroller features 2 seats or a removable rear seat for a standing platform for your older child. Sometimes kids just can't sit still, so give them the option of sitting, standing, or sleeping in this convertible double stroller. This stroller features a parent tray with cup holders to keep your phone, keys, and drink within reach. It also includes a large storage basket under the seat for holding everything you need for a busy day. Choosing a car seat can be one of the toughest decisions you face as a new parent. Trust your new bundle of joy will be safe and sound in this Baby Trend Flex-Loc Infant Car Seat. For little ones weighing up to 35 pounds and 30 inches long, this infant car seat features a 5-point harness with simple one-hand adjustment and push-button release, 4-position height adjustment, and a height-adjustable seat back for a secure and snug fit. It includes a stay-in-car base with one-hand seat release and a carrying handle that is as comfortable as comfortable can be. It also comes with a boot to keep your baby warm on those colder days. This rear-facing infant car seat conveniently fits your lifestyle and makes transporting your child a simple and safe experience for all.